×œ××¨×™××œ ×”×ž×ª×•×§, ×ž×–×œ ×˜×•×‘ ! ×©×ª×’×“×œ ×•×ª×¢×œ×” ×ž×¢×œ×” ×ž×¢×œ×” ×‘×ž×¢×œ×•×ª ×”×ª×•×¨×” ×”×™×¨××” ×•×”×—×¡×“ .×›×©××™×¤×ª ×”×•×¨×™×š ×”×“×’×•×œ×™× ×‘××”×‘×”,×ž×ž× ×—× ×•×™×¢×œ ×˜×•×§×¨ ! Mazal Tov! Keep up the great work! ×ž×–×œ ×˜×•×‘, ×”×¨×‘×” × ×—×ª! Ariel, Your Idea to donate to this sacred cause shows what a "manch" you are! Mazal Tov Tzadik ! With love to my great grand son Ariel, I am proud to be your Savta.Love. Mazal Tov Ariel! May you continue to bring joy and nachas to your wonderful parents and to Hashem. You're inspiring! Have a lot of Mazal Tov and success! Mazel Tov! what a beautiful idea. Ariel, It has been a pleasure watching you grow and become Bar Mitzvah. You have proven to your parents that the tireless effort they put in to raising their children and giving to the community has paid off. May you and all your siblings be ×–×•×›×” to always give your parents × ×—×ª and much joy. Wishing you a hearty Mazal Tov from the entire Goodfriend family. 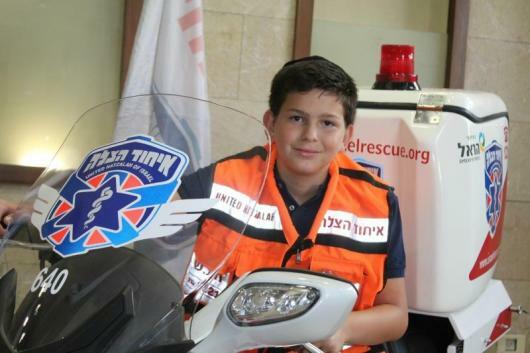 Mazal Tov, and thanks to Uriel R for sharing your inspiring campaign with us! Yasher Koach to you and Mazel Tov -Tizkeh L'Mitzvot. I am a friend of Uncle Uri. Mazel tov my man very impressive what you decide to do with all your gifts!! Next time you come to Ny or Mia well go to a game together.